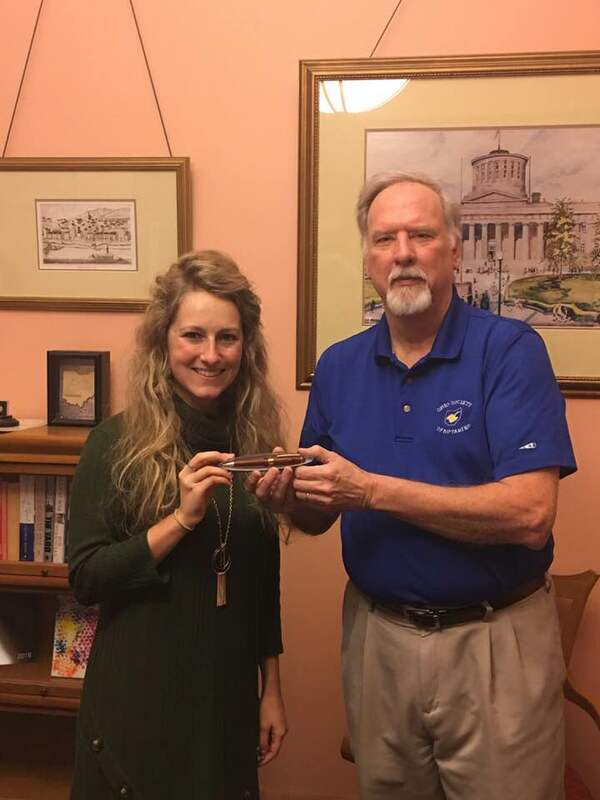 Receiving the pen used by Governor Kasich to sign the Ohio Notary Modernization Act! We will be scheduling our popular "Beyond the Stamp" Advanced Notary Seminars in NE Ohio, Cincinnati, and Columbus in the next few months. Keep an eye on the Training tab! State Senator Frank LaRose has been elected as Ohio's new Secretary of State. We will work closely with his office in implementing standards and procedures for the new notary laws. I'll keep you posted! Happy to report on two significant developments!!! Many of you know how long I've worked for years on trying to update Ohio's antiquated notary laws. These efforts have finally culminated with the passage of landmark Notary Reform legislation, entitled The Ohio Notary Public Modernization Act. Governor Kasich signed it into law on December 19, and it will be effective September 20, 2019. Eliminates the 88 separate county notary applicant criteria; all notary applications will be handled directly by the Secretary of State, and will be online. Notary applicants will be required to 1) Pass a statewide, uniform examination; 2) Pass a national background check (with fingerprints) administered by the Ohio BCI; 3) Receive 3 hours of mandatory training. This includes new attorneys. Recording of commissions with County Clerks of Court is eliminated. Permits notarization via video devices; $25 notary fee. NEW attorneys WILL have to take the training class to obtain a notary commission - it will no longer be automatic for them. Ohio will be the first state in the nation with this requirement. In addition to the major changes to the commissioning system and notarial duties, the Bill also permits Remote Notarization in Ohio. This involves notarizations over a webcam without the physical presence of the signer, and I feel will be largely utilized for real estate transactions. The new Secretary of State, Frank LaRose will develop standards and procedures for this new addition, and for obtaining an electronic seal. LOTS of details need to be finalized on this, and I will be heavily involved. For the first time in 27 years, the fee for performing a notarial act will markedly increase. The new fee will be up to $5, which brings us to a little above average compared to most of the country. As before, the fee is per notarization (not per signature), and eliminates the distinction between Acknowledgements and Jurats. All notarial Acts will have the same $5 fee. There is much to done over the next 6 months in designing the new commissioning system, exams, and training. I will be working closely with some of the Bar Associations and the Secretary of State's office on these important changes. The other major change involves the Ohio Vehicle Title form. For many years, this document has had a non-compliant notary certificate, and NO room for an inked seal. I FINALLY got the BMV folks to listen to me, and was on the Committee to re-design the document. The major changes for Ohio notaries include: 1) the document will be letter-sized, with much more room for your seal; 2) it will include the state/county venue that was missing until recently; 3) Under the signature line for the Seller, there will be wording stating that the Seller MUST sign in front of a notary! This should eliminate all those excuses we hear, that the Seller just signed it over to the Buyer without a notary. BMV anticipates issuing the the new titles around the first of the year. So it has indeed been a very busy year for OSN, and the law changes and updates we have sought for so long are finally a reality!